My wonderful husband recently got me one of those Cuisinart Ice Cream and Sorbet makers for my Birthday and I've been having a whole lot of fun with it. I like the fact that I don't have to use a bunch of ice and rock salt anymore. I like to store the bowl that came with it in the freezer so it's ready whenever I'm ready! In a medium size bowl, whisk together the egg yolks until well blended. Set aside. Pour the cream into a metal bowl set in a larger bowl of ice and set a medium-mesh sieve on top. Set aside. In a medium heavy bottomed saucepan on medium heat, cook the butter, stirring constantly, just until it begins to brown. Add the brown sugar and salt. Mix well. Slowly add the milk, stirring to incorporate. Heat until all of the sugar is completely dissolved. Do not let boil or it might curdle. Slowly pour half of the milk and sugar mixture into the eggs while whisking constantly so that the eggs don't scramble. Add the warmed egg mixture back into the saucepan. Stir the mixture constantly over medium heat with a wooden spoon or heatproof rubber spatula, scraping the bottom as you stir, until the mixture thickens and coats the spatula, about 5 minutes. Remove from the heat, slowly add the cream and vanilla, stirring constantly. Chill the mixture in the refrigerator until cooled. Preheat the oven to 350°F. Lay out the pecans on a cookie sheet in a single layer. Bake for 6 minutes, until lightly toasted. Cool. Chop the pecans and set aside. Once the ice cream mixture is thoroughly chilled, freeze in your ice cream maker according to the manufacturer's instructions. 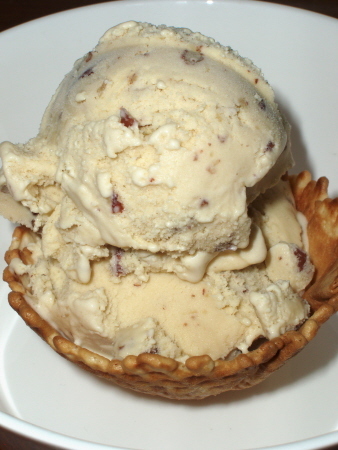 I'm sure you'll agree this butter pecan ice cream recipe makes the best butter pecan ice cream you've ever had.